You'll want to spend time customizing your categories until they represent your priorities. Some categories you'll know to add, rename, or remove right away. Others you'll discover as you get more budgeting experience under your belt. The goal is have a list of categories specific enough to guide your spending, but not so specific that your budget gets complicated. It's how you make your budget your own. Category Groups hold groups of categories (clever, huh?) that are related in some way. By default, category groups are based on our prioritization strategy. You can rename a category group by clicking the name. The only exception is Credit Card Payments, which is a group created automatically if you add one or more credit card accounts. You can rename categories the same way. Click the name and edit away! Credit Card Payment categories mirror the name of the account. To rename one, click the edit icon next to the account name instead. Click + Category Group (next to the Undo button in your budget). Enter the name for your new Category Group and hit OK. The new group will be at the top of your category list. If there are any existing categories you'd like to move to this group, just drag and drop 'em! Hover over the name of a category group. Click the + sign that appears next to it. Enter the name for your new category. Your new category will be at the top of the list of categories in that group. If you’d like it somewhere else, just drag and drop! If your budget is brand sparkling new, you may want to delete some categories—which we'll cover next. Once a category has activity though, you'll want to hide it instead. It's much less destructive to your budget. 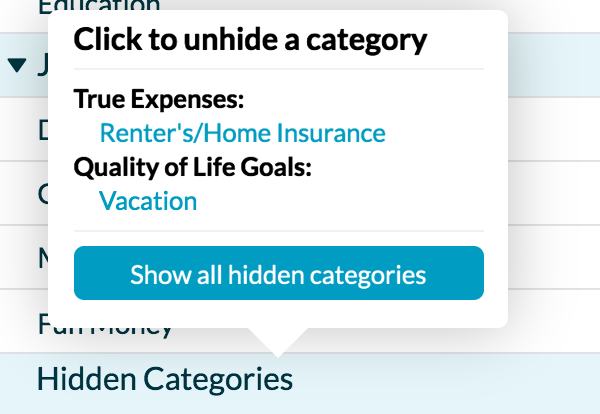 To unhide a category, scroll to the bottom of your budget and click on Hidden Categories. Then choose the category you'd like to unhide. It's possible to delete a category—or even a category group—but it can feel quite destructive to your budget if you have past budgeting and spending activity in that category. When in doubt, hide the category instead! 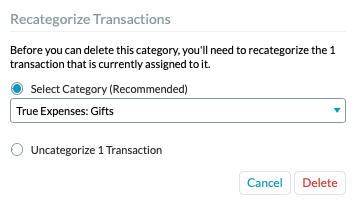 If you're absolutely sure, click the Delete button and you'll be prompted to re-categorize the transactions in that category. When you confirm the deletion, any money you've budgeted to this category (across all budget months!) will move back to To be Budgeted, and you'll need to move those dollars where you want them now. Deleting a category with past credit card activity will also impact your credit card payment categories. 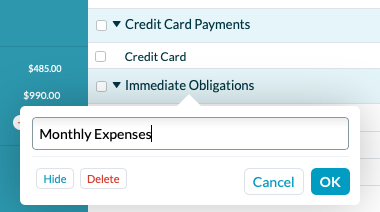 While the changes you see in your budget may feel different than you expected, the sum of To be Budgeted and Total Available (in the right sidebar when no categories are selected) will be the same before and after deleting the category.